Thanks so much for the cootie catcher. My grandchildren will love it. I’m going to use it with my math students and have them create math problems and quiz each other! They will love this! Thanks so much for this template: I’ve used it to create a fortune teller to help my daughter learn her “friendly” numbers. I’ve left your URL on the file (I trust this is ok: I wanted to make it clear the template came from here). Hope it makes the maths more fun, Cate! thanks so much for posting this! 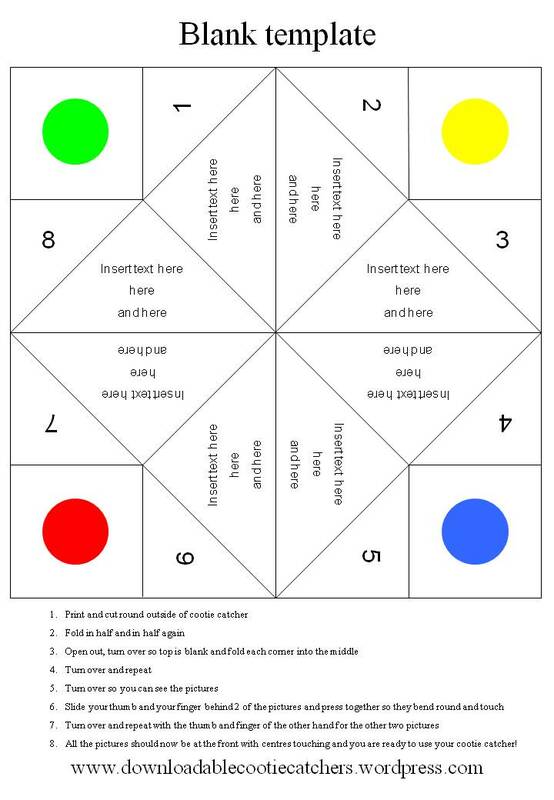 i use cootie catchers with my students, and this is a great (and time saving) template! thanks again! Hi, so glad I found this page! I’ll be using this template for BNI in the morning with each “leaf” being one of the health + nutriton products we offer, thanks very much & have a great xmas and 2014! Thanks! can I edit this and re-post on a different website, giving you the original credit of course with a link to your site? Hello. Thanks for this, I love it. I’m a librarian and have used it my library inductions. A couple of students wanted it to be bigger, so I just wondered if you had an A3 version available? I wanted to leave my thanks also, I remember playing with these as a kid! My daughter came to me the other day asking me to make these for her and I am all for it! Now she would like one for birthday invitations. I couldn’t have done this without you! Thanks Sarah! Glad you’ve found the templates useful. Great! Send me a copy if you think others would like to use it on the site. Thanks so much for sharing this freely. Very excited at the endless teaching possibilities this provides. Hi there! Thanks so much for your template!! I just had a quick question- am I able to use your template to create a resource and then use for commercial use? I would obviously give credit back to your site.